I FINALLY got to see Adam Ant....Live....On Stage..... IN FRONT OF ME!!!!!!! AAAAAHHHH! Teenage silly me now out, lets get back to business. Yes, I love Adam Ant. I still remember the day mum and dad left me alone at home for an afternoon for the first time, and finally getting to have a secret rummage through my parents rather large collection of records and LP's. Oh yes...I was introduced to the 80's Punk/New Romantics Godfather, Adam Ant. Hidding in the back amongst the Pink Floyd, Jeane Michelle Jarre (seen him, tick! ), Tangerine Dream, and Kraftwerk (tick, tick!) 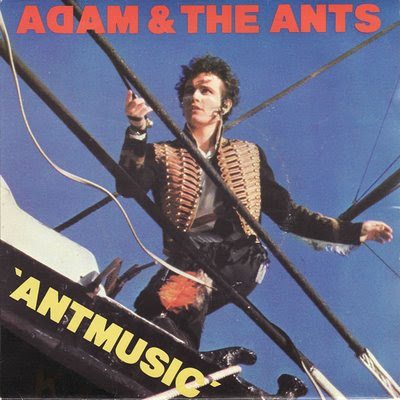 was a colourfully designed sleeve, with 'I love Adam' written by Aunt when she was younger, of an Adam Ant record, Antmusic. I fiddled around with Dad's record player, frightened stiff that I would somehow break it and then get a right old telling off when they got home. After about an hour of trying to figure out how to turn the bloody thing on, I heard joys of Adam for the very first time. Yes, I was an early starter! And still to this day, whenever I hear it being played (mostly in secret in my room) it takes me right back to that afternoon. Those double drums, his howling voice, his dancing... *swoon*. I thought he had retired, suffering from ill health, and that I would never get the chance to see him play live. I yearned to hear him play live. Yes, bit sad, but I'm sure you all have a band you have always wanted to see and know what I mean. So when I was told by my manager at work that Adam was playing in Brighton, I called up straight away, and was told.......SOLD OUT :( serious sad face here. My one chance and I'd left it too late. Not only that, but aforementioned Aunt also wanted in (it was her record after all ;) ) so I had let her down. A few months later, living on with the guilt of being lazy and missing out, we went along to a boot sale, and I found, 3, yes 3 Adam Ant records! I always keep an eye out for them and have never ever found one in all the charity shops I have trawled. I got chatting to the store holder and it turns out he was the organiser of the gig Adam had played back in May, and that because he enjoyed it so much and was sold out, was coming back again in June! Woop! Straight on the phone to Dad, Aunt and the Mister, checked with them, then did the deed and booked tickets. And it was not a disappointment. Can you tell how much I enjoyed myself? bluuuurrrry! I thoroughly enjoyed myself, and when he played THAT song, I did go a little bit nuts and throw myself around, but boy was it worth making a fool of myself. I don't think the Mister quite knew what he'd let himself in for. I had pre-warned him, and had asked him numerous times to paint the white stripe across his face, but he still refuses. So yes, I finally got to do something I thought I never could, and will remember that night for years to come. If Adam goes on tour again, I highly recommend you go and see him. He is a true entertainer, and his voice has not faltered one bit!